In 1962, U.S. President John F. Kennedy moved in the United States a bill for consumers rights the Congress passed it with earnest consideration. Originally, only four rights of consumers had been specified. Over the years, the consumer's rights were finally given a much deserving concern and elevated to a position of international recognition and legitimacy. After a decade of prolong and hard lobbying, on April 9, 1985, the United Nation approved the general guidelines for consumer protection, proposed by the consumer's international, and other consumer rights group. The U.N. had amended the original four basic consumer rights to a total of eight, which were acknowledged by its participating members. Celebrating the World Consumer Rights Day is with a purpose to unite consumers, a large but often fragmented section of the society, and reiterate that corporations must keep in mind their responsibility and not to break their promises or otherwise abuse the consumers who are so important to their survival. The occasion receives international attention, and is often marked with group discussions and seminars related to current events, underlying problems etc. and means to get rid of them in the consumer world. World Consumer Rights Day is an annual occasion for celebration and solidarity within the international consumer movement. 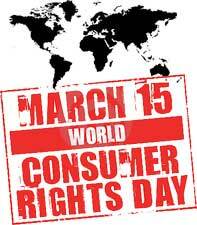 Consumer rights day was first celebrated on March 15, 1983. WCD serves as an opportunity to proclaim the rights of consumers to demand respect and protection from market abuses. It serves to drive home the message the undermining the consumer rights are tantamount to social injustice. Right to Safety - One of the original four rights, the Right to Safety protects the consumer from products, manufacturing practices or services that could prove detrimental to the health or life of the individual consumer. To ensure this right, it is the consumer's responsibility to use the product for its intended purpose and properly follow instructions and warnings. Right to Information - The Right to Be Informed requires that companies supply all of the information that would be necessary to make an intelligent decision about purchasing a particular product. This right also establishes that it is illegal for companies to furnish "dishonest or misleading advertising or labeling." Consumers are responsible for analysing the information appropriately. Right to Choose - The Right to Choose ensures that consumers be able to choose from a variety of products and services. The distributors of the products or services must price them based upon competitive markets and guarantee their quality. Consumers are responsible for comparing all prices before making decisions and identify differences between similar products. Right to Be Heard - The Right to Be Heard means that government entities should hold the consumer's interests at heart when implementing policies. Also, businesses should address customer concerns in the development and production of goods and services. Consumers are responsible for informing businesses and elected officials of issues pertaining to specific items. Right to Satisfaction of Basic Needs - The Right to Satisfaction of Basic Needs ensures that all consumers have suitable access to necessary goods and services, such as food, shelter, education, health care and sanitation. This means that consumers are responsible for governing their own consumption, so as not to impinge upon others receiving the same basic needs. Right to Redress - The Right to Redress ensures that customers have an avenue with which to receive compensation for unsatisfactory performance of service or inferior products, or for damage inflicted from their use. It is the consumer's responsibility to actively seek appropriate restitution. Right to Consumer Education - The Right to Consumer Education provides for programs and information that must be available to individuals to help them make more informed decisions about products. It is the consumers' responsibility to take initiative in learning about new and changing products throughout their lives. Right to Healthy Environment - The Right to a Healthy Environment implies that businesses and governing bodies must install policies in production and regulation which do not harm the natural world. Consumers are responsible for purchasing goods and services that cause little environmental impact for themselves and future generations. Consumers International, the group that organises World Consumer Rights Day, is a nonprofit organisation that was founded in the 1960s, following the initiative of then US President Kennedy. Reputed institutions, the 70-year-old Consumers Union (CI) in the United States to mention one, are part of Consumers International, and the fee collected from the member organisations is the main source of fund for CI's activities. Consumers International (CI) is the world federation of consumer groups that, working together with its members, serves as the only independent and authoritative global voice for the consumers. With over 220 member organisations in 115 countries, CI constitutes a powerful international movement to help, protect and empower consumers all over the world. It takes all out efforts to ensure a safe and sustainable future for all consumers in a dominant international marketplace. CI, a non-profit-earning company and controlled by guarantee is registered in the UK as a charity. CI's vision - CI is striving to put the rights of consumers at the heart of decision- making. Everyone anywhere should have access to safe and sustainable goods and services is the main criterion that CI works for. The strength of its collective power is made use of to safeguard the interests of consumers and at the same time making them aware of the responsibilities too. The vision of CI is focused on the entire world as a whole. CI's Work - Keeping the matters of the consumers worldwide, CI campaigns on the international issues with a view to achieve real changes in government policy and corporate behavior. It also concentrates on raising awareness of consumer rights and responsibilities. It seeks to hold corporations accountable and demands government action to put consumer concerns first. CI is committed to acting as a global watchdog, campaigning against any behaviour that threatens, ignores or abuses the principles of consumer protection. CI manipulates this by working with national member organisations to influence governments, highlight market abuses and raise support from grass root level. It exerts pressure on matters of consumer concerns through its official representation at global bodies such as the United Nations (UN), World Health Organisation (WHO), International Organisation of Standardisation (ISO), and the Food and Agriculture Organisation (FAO). CI tries to instill awareness among consumers about purchasing choices through all possible media. Better consumer organisations around the world with improved house skills, knowledge and expertise are coming up only with the committed involvement of the CI. It bears in mind, "If a consumer is offered inferior products, if prices are exorbitant, if drugs are unsafe or worthless, if the consumer is unable to choose on an informed basis, then his dollar is wasted, his health and safety may be threatened, and national interest suffers" and works towards best customer service. On the World Consumer Day, several countries hold events from media conferences to conventions dealing with human rights. World leaders avail this occasion to endorse the day's mission. In some cases new ideas for consumer protections are announced. Seminars and competitions are held to encourage the blossoming of novel ideas as regards consumer matters and World Consumer Rights Day continues to make inroads in the international community. As an instance of the outcome of the CI's World Consumer Rights Day we can take 'Junk Food Generation', a campaign launched to commemorate the organisation's 25th anniversary. It aims to end the marketing of unhealthy junk foods for children, as this will lead to inculcate the habit of eating foods that are unhealthy and have no nutritional value. This goes a long way in the future of the younger generation as far as their physical and mental health is concerned. This is in line with the World Health Organisation's (WHO) recommendations on the marketing of food and non-alcoholic beverages to children. Still, the problems of consumers are high, and there is still a long way to go. The Secretary of Consumer Protection Council of Tamil Nadu, India has said, "The problem with Indian consumers is that they have low expectations, improper perception and lack of awareness about solution-options." Not only in India, these qualities of consumers are still prevalent in many more countries. The former United States President John F. Kennedy in his address to the U.S. Congress on March 15, 1962 when the Bill for Consumer Rights was moved in the US Congress said, "Consumers, by definition, include us all. They are the largest economic group in the economy, affecting and affected by almost every public and private economic decision. Two-thirds of all spending in the economy is by consumers. But they are the only important group in the economy who are not effectively organised, whose views are often not heard". Let us hope that the noble purpose, aspiration and vision of the President are realised very soon with the public becoming conscious of their duty to follow their respective model code both as consumers and the producers/service renders, as every individual, irrespective of their position, is a customer in one way or the other.